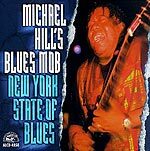 CD reviews: "Smoke and Steel" and "New York State of Blues"
By Michael Hill's Blues Mob. These reviews first appeared in the November 7, 1998 edition of the American Reporter. When Living Colour hit the scene some ten years back, folks were intrigued at how a band might combine hard rock and funk. The band lost interest in the whole idea after just a few albums, though, and so did most of the rest of us. Not the Kinsey Report or Michael Hill, though. Stablemates at Chicago's Alligator Records, the two acts perform distinctive versions of the same vein of blues: Hard-edged, rock-oriented music built around fire-breathing guitar work. Both have also encountered the same challenge in trying to break through to the mainstream: Their music has too much blues for rock audiences, too much rock for the blues crowd. Based on the latest releases from both acts, commercial success would seem within reach if they can just get enough folks to hear them once. While the Top 40 today is populated equally by the predictability of "alternative" rock and the easy-listening sounds of Celine Dion and Mariah Carey, both Hill and the Kinseys provide a fix of the kind of muscular, hard-driving music formerly provided by bands like Van Halen or the Allman Brothers. Only at a more interesting level. Both of these African-American acts come from solid musical backgrounds in the blues tradition; this lifelong exposure to real musical artistry permeates their songwriting and performances. Both Hill and Donald Kinsey (lead guitarist for the Kinsey Report) can improvise in their solos, something most rock guitarists can barely dream about. 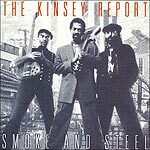 "Smoke and Steel" marks the Kinsey Report's return to Alligator Records after a contract with a major label failed to provide the bump into stardom they'd hoped for. Donald and brothers Kenneth (bass) and Ralph (drums) Kinsey have toned down the pace a bit from previous albums, concentrating more on songwriting (which continues to improve) and arrangements. The result is an album as thoughtful as it is energetic, one that doesn't simply try to blow past you like a Randy Johnson fastball. They mix things up a bit more, and the music is more interesting for it. Michael Hill's third album for Alligator, "New York State of Blues," also shows a greater willingness than previous outings to try a change of pace. Used to be, Hill came at you with everything he had up front. It was impressive, but often overwhelmed the listener's ability to take it all in. Still, as the title implies, there's a certain East Coast attitude involved, a brazenness or cockiness to the music. Hill and his Blues Mob have the chops to pull it off, though. He's one of the most exciting guitarists around  and a fine rough-voiced singer to boot.